I will cover various design considerations, misunderstandings of early designs, whether corporate infrastructures have adjusted or should be adjusted. At the end we will take a look into challenges for future designs, on-premises and in the cloud. Who am I in the cloud? In this session I will talk about challenges and opportunities of cloud computing in general and Office 365 in special: Does cloud mean sunshine for the CIO and rain for the Admin? Which skills are needed? What is the long-term strategy for cloud computing in your enterprise? The IT-Admin TechTalk will be in Frankfurt and is in German language. Also the next international conference is coming up. The Experts Conference Europe will also be in Frankfurt in October this year. It is about half a year after TEC USA in Las Vegas. TEC is known to be the best and high-skilled conference when it comes to Directory Services, and has expanded over the years beyond the AD and FIM tracks to also cover Exchange, Sharepoint and Cloud technologies in different tracks. TEC is attracting the most high-skilled speakers, Microsoft values the conference so much that they send more Program Managers and Developers of the product groups to TEC than to their own IT-Pro Conference TechEd. Additionally TechEd EU will not happen this year, so maybe you are able to convince your boss. Las Vegas has been a great success, lots of interesting sessions, a lot of community interaction, and I’m very much looking forward to Frankfurt. This conference is in English. At The Experts Conference I will speak three sessions, but will post details later when the agenda is done. 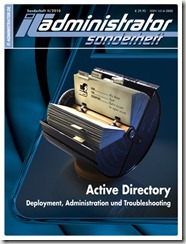 I was just pointed to the blog of David Loder who’s pointing out that the Release Candidate of Exchange 2010 is changing the permissions enforced by AdminSDHolder to critical groups to allow Exchange Organizational Admins to change the group memberships of Enterprise Admins, Schema Admins, Domain Admins a.s.o. OK, one of Microsoft Program Managers already responded, and I do agree that this is not a released product and pre-release versions are there for finding those bugs. The first one will make sure that existing OUs allow Exchange Admins to control Group memberships (actually I’d even like to discuss if this is necessary – usually group membership administration is not done in the same instance where groups are mail enabled – the first one would be a generic help-desk task, the second a Exchange-Admin task). I’d also prefer – if OUs are touched – that if the organization decided to block security inheritance at one point that a new version of some software shouldn’t go beyond that point but respect the design but warn them about the consequences. The second suggestion makes sure that new OUs will get the permissions by default when creating the OU. is there no process for infrastructure critical changes as changing the adminSdHolder (I’d think that the Active Directory Product Group should be involved if something as this is happening, how should they ensure security if other groups are mangling around with their mechanisms)? why is this coming up in RC? If a product is at Release Candidate Level, it’s mostly finished and usually there are not this many changes approved afterwards (unless they are critical). I hope that this will be fixed! Thanks David for finding this one, very interesting, and I hope it’ll be fixed! And since I wanted to mention this: if you are in Europe (or want to come), The Experts Conference (TEC) is in Berlin next week and it is THE place for Active Directory and Exchange.